As well as being known and sung internationally, the popular song 'Cockles and Mussels' has become a sort of unofficial anthem of Dublin city. A statue to her is a familiar landmark at the corner of Grafton and Suffolk Street, Dublin. 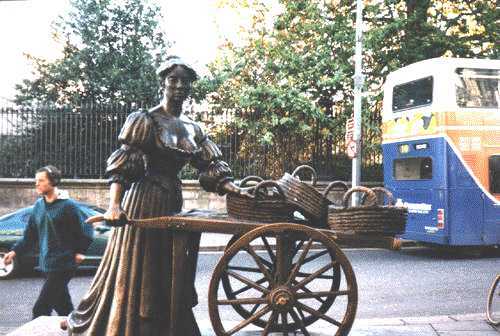 This is a street sculpture of Molly Malone on a busy Dublin corner. They say she was a fish merchant by day and of quite a different occupation by night. I, myself , think it is a smear. I like Molly. She is my favorite Dubliner. But the locals still call the sculpture "the tart with the cart." Alive, alive-O! alive, alive-O! Crying cockles and mussels, alive, alive-O!